Where: Durham County District Courthouse, 501 Dillard St.
Durham, N.C. – On December 5, eleven anti-racist activists return to court to face charges stemming from two demonstrations against white supremacy and Durham’s (former) Confederate monument. 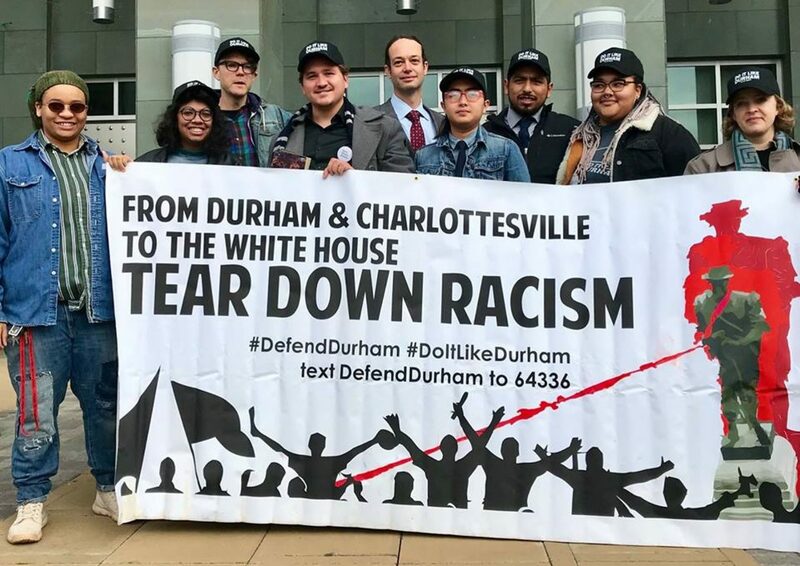 Nine are charged in connection with the removal of a Confederate statue on August 14; the other two face charges related to the community mobilization to defend Durham from an announced march by a local KKK chapter on August 18. It will be the first time all eleven will appear in court together. Community activities and supporters will gather at the Durham County Courthouse (510 Dillard Street) on December 5 beginning at 9am. Activities will include an invitation to submit ideas of what should take the place of site of the former monument. A press conference will be held at the conclusion of the court hearing for the eleven anti-racist activists. Thousands of people across North Carolina and the US have signed petitions and participated in three call-in days to drop the charges – the most recent on November 30. The case has garnered national and even international attention, with many unions and other progressive organizations submitting statements to the arrestees noting both the significance of their actions and pledging support to beat the charges. “Removing symbols of white supremacy from our community is not a crime. What happened on August 14 was a service to the Durham community and an example of taking righteous action, a small step to correct centuries of injustice,” said Jess Jude, one of those facing charges in connection with the statue removal. If DA Roger Echols chooses to pursue charges against the eleven, the defendants will invite community members across Durham to sign up to be witnesses for the defense. “We will invite all those who believe that Durham is a better place without the monument, that the monument had no value to our community, and was in fact a liability, to sign up to be a witness for our defense. We will set up an online form and email to collect your testimony,” said Elena Everett, one of those facing charges in connection with the statue removal. The #DefendDurham group will also open a community contest for Durham residents to submit ideas of what should replace the pedestal where the Confederate monument once stood. During the December 5 court hearing, art supplies will be set up outside the courthouse beginning at 9am for people to begin to submit their ideas. Call-In Day Nov 30: Drop the Charges!